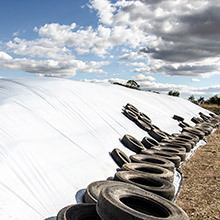 Silacover™ silage covers are made from high-quality polyethylene co-extruded multi layer black/white reflective film. Silacovers™ are UV protected for a minimum of 12 months. Available in two weights being Heavy Duty and Extra Heavy Duty for application in either finer pasture based or coarser maize type silage. 12 months UV protection in Australian conditions.